It's been a while since I've posted anything about what I've been reading. The world isn't all genies and fairy tales and some of you might be surprised by the grown-up books I actually read in my free time. Here's the low down on one I finished over Memorial Day weekend. I’m a huge fan of books set in Appalachia. While Charles Frazier’s Cold Mountain is an obvious example, I’ve also written previously about Amy Greene’s book Bloodroot, about three generations of domestic strife in the form of the sometimes dangerous bonds between mothers and their children. Silas House’s Clay’s Quilt, A Parchment of Leaves and Coal Tattoo are others I’ve enjoyed. House’s stories also encompass three generations of a family in a place called Free Creek and have been called “a long love poem to the hills of Kentucky.” My Old True Love by Sheila Kay Adams is a novel inspired by the ballads of the English, Scottish and Irish that settled Appalachia in the 1700’s. Adams’s book is largely about a family whose men serve in the Union Army while their wives and children endure hardship and harassment from Confederate Home Guard during the Civil War in Marshall, North Carolina. The narrative is rich with song and I loved the audiobook version for how it showcased these long-sung tunes in a unique way. It was with these other much-loved Appalachian Mountain-based reading experiences under my belt that I turned to Ann Robbins-Phillips’s Revenge. Based on an actual feud in the North Carolina mountains that culminated in the midst of the Civil War, Ann Robbins Phillips has used material from her own family’s past to tell a story of revenge sought by a man who witnesses the murder and brutalization of members of his family as a nine year-old boy. Hate rose like bile into my mouth and burned my nose and eyes. Senseless deaths. These were my family. They weren’t necessarily Jackson County’s most honorable citizens, but neither did they deserve to die the way they had. Right or wrong, to the last drop of my blood………..I’m ready to serve revenge where none has been dished out. So begins Nathe Watson’s quest for vengeance against his family enemy the Hoopers. While searching in secret for the men who murdered his family, Nathe takes refuge with a young widow named Addie Fisher and her two small children. Ever fearful that he’ll be discovered by the Hoopers, Nathe and Addie endure the mountain hardships of sickness, fire and death as they work to resurrect her neglected farm. Someone does know why Nathe has returned to Rich Mountain after ten years, and it could ruin everything, especially when it seems Nathe’s desire to reestablish a family of his own may be just as strong as his need for revenge. There’s something he doesn’t know about the woman he’s come to care for, however—something that could make all the difference. I enjoyed portions of Revenge greatly. The first chapter, for which Robbins-Phillips won a national fiction contest, is gripping and later scenes describing the tragic death of a small child and beloved character made me cry; they were emotionally riveting. I very much liked all the characters in Revenge, and having a reader care for and thus become invested in a character is no easy task for a writer to accomplish so well. Despite the feud I knew the book to be about from the get-go, I hoped to read about creeks and streams, valleys and cottages built into the sides of rugged mountains that look down into “hollers” far below. Setting is such an important part of Appalachian stories, after all, but Revenge is heavily dialogue driven. There is so much talking going on that I found myself craving more description of the mountains and farmland Nathe and Addie work to revive. Told in Nathe’s first person point-of-view, there are plenty of opportunities for the reader to see Rich Mountain through Nathe’s eyes, but Robbins-Phillips doesn’t always capitalize on those opportunities and that disappointed me a bit. While the dialogue does propel the action of the story ever forward, there were times I found conversations between the characters to be a little stiff and formal. Dialect is as important as setting in Appalachian novels and serves as a constant reminder of place and time. When it feels wrong, it can pull a reader from the story and there were a few times this happened for me. This was also the case with errors and typos that can mark the self-published title as such, despite a beautiful cover and impeccable layout. I gave the book 3 ½ stars on Goodreads. If you’re a fan of Appalachia—the place, the people and their stories—then I think you’d enjoy Revenge. 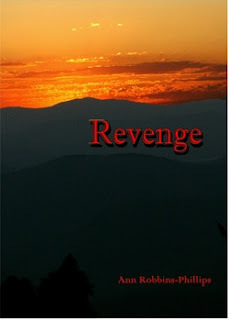 If you appreciate the Hatfield & McCoy legendary feud, Revenge is also a book for you. In fact, readers of Hatfield & McCoy books have been recommended Revenge on Amazon.com. Robbins-Phillips second novel Bad Blood is the sequel to Revenge and further explores the mistrust and betrayals of the Hooper and Watson families. While it’s entirely common for these kinds of stories to explore the emotions and difficulties of mountain life, in the case of the Revenge series, these musings don’t just come from the imagination of the author, but from the imperfections of real people in her family history. 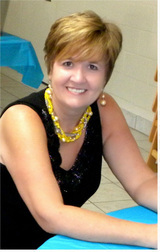 For more on Ann Robbins-Phillips, Revenge and Bad Blood, please visit Ann’s website at http://annrobbinsphillips.weebly.com. 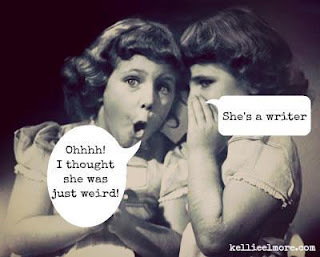 Writers are weird. It’s entirely true. Most of us will readily admit that we’d rather sit quietly alone somewhere reading or writing when the alternative is an overwhelming room of hundreds of other people. Sure, we’re social and can hold our own in conversations that involve books, writing or a subject we’re highly engrossed in researching for our latest project, but we largely prefer to hover at the periphery of chit-chatty conversation—we’re studying your dialogue, don’t you know? As I type this post, I am surrounded by 200 student athletes and their parents at a banquet to celebrate a school year of sportsmanship and All-American competition, yet I am awkwardly separate and alone. It won’t be until I awake around one or two a.m. tomorrow that my brain finally comes up with the perfect words I could have used this evening to insert myself into one of the small clusters of laughing and talking people at the tables all around me. For now, I just look up every few seconds from my smartphone and smile like an imbecile at anyone in sight. My good friend and fellow writer Mary Weber Furlow and I share a theory that we, and most other creative people we know, are afflicted with at least some small degree of an Asperger-like syndrome that makes us over analyze and then feel uncomfortable about our “performances” in certain social situations. What I have come to realize recently is, while this kind of insecurity has a tendency to make me stand out like a lump at a cafeteria table clutching her Android like a floatation device, it’s also what makes me and other writers good at defining the motivation, affects, and responses of the characters in our work. So writers are weird. Big deal. I guarantee you we aren’t the strangest folks you’ll ever meet or sit across a table from lauding the achievements of teenage golfers, cheerleaders and football players. Please, cut us a little slack and forgive our awkwardness. And, while you’re at it, you might want to mind what you say to--or even near--us…unless, of course, you don’t mind ending up in one of our novels. In sixty-nine days, my 1st novel will be available to readers! I feel like I've been pregnant for the last three years and an induction date has finally been set. 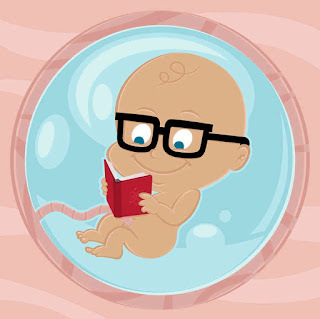 Like any expectant mother, I'm alternating between feelings of excitement at bringing something new into the world and worry for what the world will do to my little one. Will readers hold this piece of me lovingly and with appreciation? Or will they dropkick it into a corner and run screaming from the room? Ya'll play nice with my baby!